The Membership Packages option includes recurring option. You can create unlimited packages, each with an expiration date in x days, weeks, months or years. You select the number of listings and featured listings in each package. Or, you can enable Paid Submission and charge for each submission. This option includes the possibility to ask an extra fee for properties to be featured. In WP Residence you can create your own custom property fields, and you can add custom Advanced Search spots with your own fields. You can control the global header and select if you wish to show property theme slider, google maps, revolution slider, image or no header. Each page allows you to overwrite global options. Dedicated Support Team to answer all your questions, comments and requests promptly. 100% Responsive on all Smartphones, tablets and desktop computers & Retina ready. Full control over the names of categories, cities, areas and pins. Advanced Search Options: show advanced search over slider YES/NO, show advanced search globally (YES/NO), show advanced search closed or open by default. 2 level menu navigation, with full control over its colors. Full control over theme’s colors with unlimited color options. An easy way to change Logo, footer logo & favicon from Theme Options. Hundreds of Google Fonts available in Admin Panel. Google Analytics field available in Theme Options. All you have to do is copy/paste the code from your own account. 4 Column Widget Footer that you can customize from Admin. Copyright Footer Text editor available in Theme Options. Footer Menu to add any links you wish. Social Share buttons integrated in Blog Post, Property Post, Properties List. Social Widget with 10 options for header & footer. SEO Optimized and compatible with any third party SEO plugin you’d like to add. Default settings: County, State, Zip, Country, City, Area, Type, Category, Lot size, Bedrooms, Bathrooms, Rooms, Price, after price label. Twitter, Facebook, Linkedin and Pinterest. 30+ shortcodes from WPESTATE and Visual Composer. And many more attractive features! 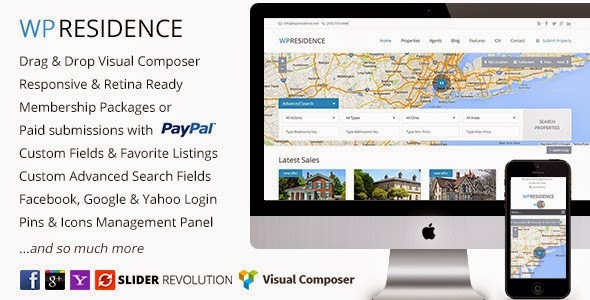 Item Reviewed: WP Residence New Real Estate WordPress Theme 9 out of 10 based on 10 ratings. 9 user reviews.